Saint Rose Orchestra director David Bebe (left), a cellist and no stranger to concerto competitions, with student winners of the Patricia Brady-Danzig Concerto Competition, Amarie King, James Alexander and Gabriel Pellino. Gabriel Pellino, a Saint Rose music student who has played the cello since age 9, spent a year practicing the first movement of Schumann’s Cello Concerto in A Minor to prepare for the College’s annual concerto competition. To do well, Pellino needed, of course, to master the notes and he needed to capture the brooding quality of the 12-minute movement. But the student felt he also needed to study the composer. He wondered about the sad feeling of the piece and looked for clues into why Schumann introduced themes he never returned to. After competing in November 2015, Pellino won the Patricia Brady-Danzig Concerto Competition in the strings category. Amarie King, a flute player, won in the woodwinds category and James Alexander won for voice. 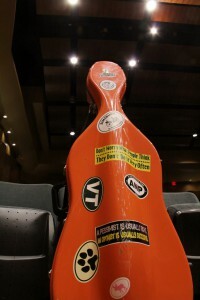 The three students impressed a panel of respected musicians who are not affiliated with the College. The prize: the unusual opportunity to perform as soloists with the Saint Rose Orchestra at its February 20 concert. And as part of that prize, the competitors also get to steer the program. The orchestra will perform, and Pellino will play the solo from, the somber Schumann movement. James Alexander, a baritone, will sing the solo he prepared, “The Count’s Aria” The Marriage of Figaro, as the orchestra performs. King, a junior majoring in music, will perform her solo from the challenging Hungarian Pastoral Fantasy for Flute by Franz Doppler. Doing so is something many musicians with many more years of experience never achieve, noted Assistant Professor David Bebe, the orchestra director, who established the competition in 2010. Making a piece of music competition-ready, he explained, requires skills that raise students’ musicianship. The orchestra director cited another challenge inherent in the competition: paying to rent the music. And this would not have been possible if Patricia Brady-Danzig ’53, G ‘56 a classical soprano and avid supporter of the College’s music program, had not sponsored the competition for the past two years. She, like Bebe, said that most people are not aware of the expense of holding a concerto competition. A celebrated singer who performs worldwide and has appeared frequently at Saint Rose, Brady-Danzig is eager to see the College music program maintain its high standards. She received an honorary degree from her alma mater in 2001 reflecting her devotion to Saint Rose, the first music major so honored. Bebe explained that Brady-Danzig’s generosity ensures that strong musicianship continues by allowing students to select and perfect work that best showcases their talents and proficiency. Without her assistance they might instead have been limited to work that was affordable to rent for the orchestra. Instead, the performers went for the best pieces they could, even if they were really difficult or obscure. For King, studying the Nielsen composition was so valuable precisely because it is not widely known. James Alexander, a baritone, said that The Marriage of Figaro had called on him to sing an F at the top of the register. A junior who transferred to Saint Rose last fall, Alexander has actually performed solos for opera companies in Pittsburgh, Washington and New York City. Nonetheless, appearing before the judges at the Saint Rose competition had been nerve-wracking. To him, that was the point. “There’s always a nervousness that comes with any performance,” said Alexander, who is majoring in music. “You have to use that energy to push you forward and this was no exception. ← APCA, Baby! – Making Leadership Development Fun!